CLEARFIELD, Pa. June 29, 2004 - People from New York and Ohio come to Denny's Beer Barrel Pub for a pretty big hamburger: 6 pounds of beef, one large onion, two whole tomatoes, a half a head of lettuce, 1 1/4 pounds of cheese, top and bottom buns, and a cup each of mayonnaise, ketchup, mustard, relish, banana peppers and some pickles. On Monday, the eatery hosted the Burger Challenge, which will be featured on TV's Food Network. The behemoth burger, known as Ye Olde 96er, and other large ones are featured on the menu for anyone daring enough to give it a try. "We already had a 2- and 3-pound challenge, which I thought were awesome, but my daughter was going to Clarion University and she called and said 'Dad, I think somebody up here has a 4-pounder,' which is bigger than us and I said 'Oh yeah, well today we have a 6-pounder.' That's exactly how it was conceived," said Denny Leigey Sr., the restaurant's owner. 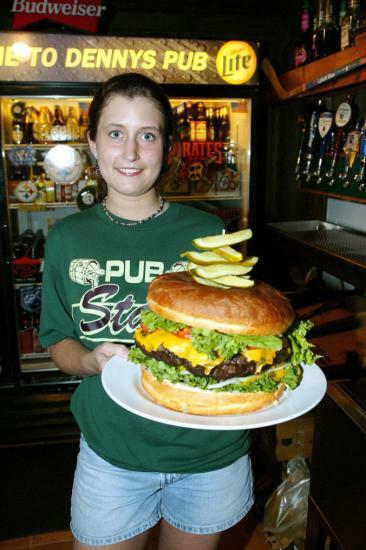 Those who try to tame the 6-pound hamburger have a time limit: They must do it in three hours or less. Competitive eater Eric Badlands Booker has tried it three times. On his last try, he stayed at the restaurant for 7 hours and ate the entire burger. Rachel Pittman, who works at Denny's, was the only woman competing this week. "I'm probably not going to get the whole thing down, but I'm going to try to," Pittman said. "If I can get the meat down, I'll be happy."